This A4 Folio Box is ideal for general paper storage or for use on the move. A4+ size with a 25mm capacity, it will hold up to 250 sheets of paper. It is made from robust polypropylene for added durability. The front cover incorporates an index/business card holder for personalisation. The welded sides add strength whilst the elastic corner closure and cutaway internal front panel make access easy and keep contents secure. 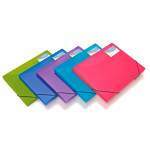 Pack contains 5 assorted coloured files.